As is the basic tenet of democracy, perhaps the greatest sin against the citizenry is controverting their right to know. Especially about men who have led their country. Men, who they have been told, the citizenry owe a debt of gratitude to. Much like Jawaharlal Nehru. India’s first Prime Minister who is often tom-tom as the maker of modern India. As the architect of our little world, as we know it. History, it is said, is written by the victor. What is to be inferred, is that history is written by the loyalists of the victor. By court jesters and poets who write ballads in praise of the emperor. Unfortunately, our politicians and their voguish history is no better. We are told ‘Chacha Nehru’ was a decent man. A just man. An honest man. An honourable man. A nationalist. A visionary. And perhaps he was. But the measure of politicians and leaders past, lies in his failure. Failures so carefully immersed in hollow flattery, that they have been lost in the pages of obscure books. What needs to be weighed is whether the leaders decency, justice, truth, honour and vision was what his country needed. Was what his country deserved, or even, what his country is told they got. It is time perhaps, for the sake a divine future, to evaluate the past with integrity, sans the sycophantic lens donned by our intelligentsia. And it for that purpose, I intent to write this series detailing the Himalayan blunders of an honourable man, and to start with, I intend to focus on some of the blunders which have faded from the public memory. After the Nawab of Junagarh had fled to Pakistan on 26th October 1947, the Indian army moved into Junagarh on 9th November 1947. How the accession happened, Nehru and Patel’s role in the process, is the subject of a different article. But after the famed uprising, Sardar Patel arrived in Junagarh on 13th November 1947 to a massive reception from the people of the state and had vowed to rebuilt the dilapidated Somnath Temple that was attacked 17 times in its existence, most brutally by Islamic invaders. When Sardar Patel returned to Delhi, the decision to rebuild the Somnath temple was passed in a cabinet meeting and decision was made for the state to dole the expenses. A decision later overturned due to MK Gandhi’s insistence, that the people be asked to pay for it. Gandhi was assassinated in 1948 and Sardar Patel’s soul departed in 1950. After the demise of Sardar Patel, the task of Somnath Temple’s restoration was to be undertaken by then cabinet minister, KM Munshi, who was the Chairman of the Advisory Committee of the Trust formed for this purpose. “Yesterday you referred to Hindu revivalism. You pointedly referred to me in the Cabinet as connected with Somnath. I am glad you did so; for I do not want to keep back any part of my views or activities….I can assure you that the ‘Collective Subconscious’ of India today is happier with the scheme of reconstruction of Somnath sponsored by the Government of India than with many other things that we have done and are doing. The intention to throw open the temple to harijans has evoked some criticism from the orthodox section of the Hindu community. However, the objects of the Trust Deed make it clear that the temple is not only to be open to all classes of the Hindu community, but, according to the tradition of the old temple of Somnath, also to non-Hindu visitors. Many have been the customs which I have defied in personal life from boyhood. I have laboured in my humble way through literary and social work to share or reintegrate some aspects of Hinduism, in the conviction that that alone will make India an advanced and vigorous nation under modern conditions. 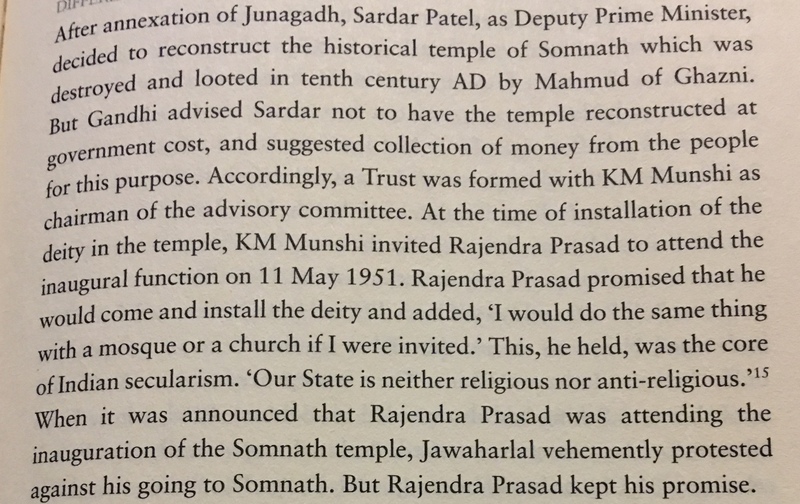 Upon the restoration of the Somnath Temple in 1951, at the time to ceremonially install the Jyotirlingam, KM Munshi invited Dr. Rajendra Prasad to inaugurate the temple and install the Jyotirlingam ceremonially. That Jawaharlal Nehru was vehemently against Dr. Prasad attending the ceremony has been detailed by many. The reference cited by Mr. Godbole is that of MJ Akbar’s “Nehru the making of India”, page 462. The reference of Nehru’s disdain for the reconstruction of the Somnath Temple also comes up in RNP Singh’s book – “Nehru, a troubled legacy,” on page 53. 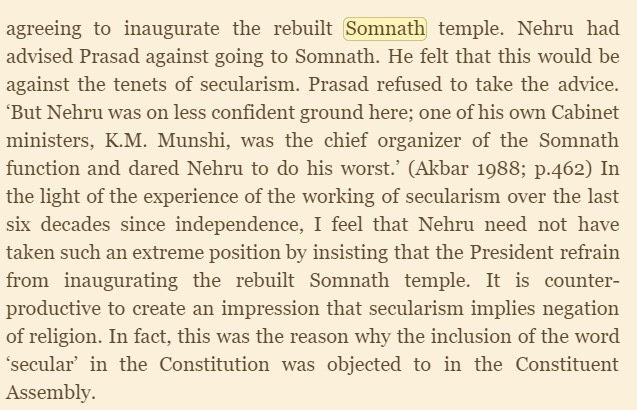 In another book by Rajnikant Puranik, there is a detail of the letter Nehru wrote to Dr. Prasad detailing why he was opposed to him attending the inauguration of the Somnath Temple. While Dr. Prasad still attended the inauguration because for him, the state should be neither religious or irreligious, his grand speech at the ceremony was blanked out by official channels on Nehru’s insistence. Such was Nehru’s inexplicable hatred. I say inexplicable hatred, because ‘secularism’ didn’t explain his behaviour. Secularism would typically mean separation of religion and state. Or as Dr. Prasad had put it then, the state not being religious or irreligious. While Nehru was opposed to the reconstruction of the Somnath Temple to preserve the ‘secular fabric’ of the country, it was him, Pandit Jawaharlal Nehru, who continued the Port Hajj Committee Act of 1932, enacted by the British and expanded it to the Hajj Committee Act of 1959. It is also inexplicable that while Nehru was against the restoration of the Somnath Temple which was being done from public money, he had no qualms when the Government paid for the subsequent restoration of Sanchi and Sarnath, the Buddhist places of worship. This baffling dichotomy can’t be seen in isolation. In Jawaharlal Nehru’s book, “Glimpses of World History”, written by him in 1934, there is an interesting passage that not only gives us a coup d’œil into his skewed thinking, but also his blatant disregard for history. Jawaharlal Nehru gives himself away. This blatant misrepresentation of history to glorify a brutal invader such as Mahmud Ghazni can be either written off to unscholarly pursuits, or his deep need to glorify the Muslims invaders so as to cater to a specific section of the Indian society. To showcase his blatant distortion, I attach herewith pages from ‘Lives of Indian Images’ by Richard Davis, 1999 (Princeton University Press). 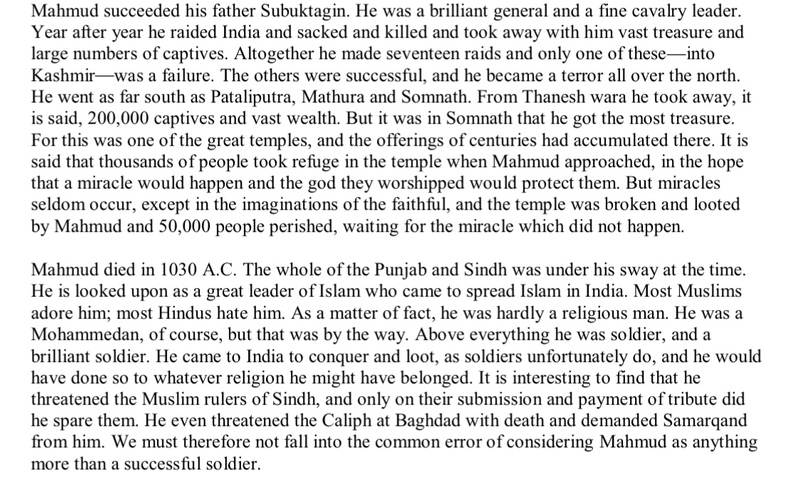 To start with, Ghazni refused to view the idol of Somnath as an economic commodity. He insisted that it was primarily a Hindu religious object and his first duty was to destroy it. A couple of other snippets taken from the same book, pages 105-106, reveals the misrepresentations in Nehru’s book. 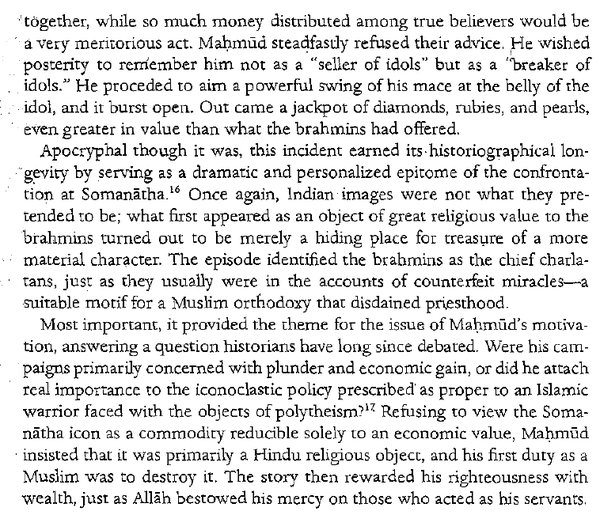 The historian refers to how the Brahmins offered Ghazni vast wealth if he spared the idol, but Ghazni refused. Ghazni even broke the Somnath idol and took its pieces to be trod over the footsteps of Jama Masjid in Ghazna, Afghanistan. In such an event, it is unfathomable for Nehru to call Ghazni non religious and a brave soldier, no less. While the other historical facts mentioned by Nehru are also dubious, they make a discussion for another day. His treachery as far as the Somnath temple is concerned and the psychology behind it can be understood from what he said in a completely different context. When the Hindu Code Bill was being discussed, Dr. Rajendra Prasad thought it was discriminatory to alter personal laws of Hindus and not Muslims. Dr. Prasad was in favour of the idea of ‘Indian Code’ that applied to all Indians. It is evident that Nehru was far from being a secularist. He treated the minority with kid gloves while the onus of secularism was enforced on the majority with impunity. Whether in his narration of history or in the laws he enacted, or even the right to worship. The legacy of appeasing the minority at the expense of the majority was indeed a creation of Jawaharlal Nehru. It is indeed a tragedy of our modern times, that a leader who sought to oppress the majority in a bid to appease the minority is tom-tomed as the beacon of secularism. Of honour. Of justice and of morality. The Somnath Temple was and always will be a symbol of Hindu resilience. A symbol that the Hindu faith weathers through. That it will survive inspite of invaders and ‘secularists’.